A game based spelling app encouraging imagination to help improve spelling. The app help with spelling of nearly 300 of the most common words in the English language and improves vocabulary of the users. I really like this app and definitely enjoyed playing it. The developers have certainly completed a lot of research and from viewing their website you can see that a lot of work has gone into creating an app that will engage young people but also help them to improve in the important aspect of spelling. The website itself has a large amount of information on it, including the theory behind the app, who the developers are and their backgrounds, videos of the app in action and also curriculum related information from the US, UK and Australia that the app links too. Often curriculum apps try and incorporate a game play style within their apps to differing successes however Spellwick goes about this the other way with the developers creating a fully fledged game that also has the added bonus of helping young people to improve their spellings. In this app it certainly works and works very well as this is the type of app that you would enjoy playing on no matter what your reasons were: educationally or not. On the home page of the app you have a couple of different options to choose from but immediately you realise you fully immersed in a fantasy world. You find yourself in a medieval type room with five different doors to choose from. These doors are all different parts of the app including the different types of games you play to help increase you spelling abilities. However, the first door you want to choose is the comic door. Once through here you get to read and listen to a comic outlining the story of the app and the reason you are called into action. The graphics are really well done in both the comic and throughout the rest of the app, the voice-over however is a little jarring, not quite a slick as the rest of the app but certainly not a major issue. 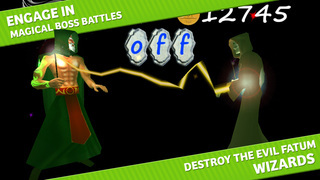 The game hinges on a battle between good wizards and witches and evil wizards and witches who are attempting to take over the land of the good magical beings. The user is tasked with powering up the magical wand of life to help defeat the evil. They achieve this by spelling correctly which makes the ‘spells’ in the app as strong as they can be. This link between magical spells and young people’s spelling abilities is brilliant and spelling can certainly be a difficult and sometimes boring thing to do however by linking it to something so fantastical there is little chance young people will be bored improving their spellings through this app. Once you’ve read the comic and understood what you need to do you return to the hub of the app where the other doors lead you to different classes in the magic school. Your job is to then learn the spellings and move through the different levels in each class before you face one of the evil wizards/witches using your knowledge of spelling to defeat them. The better your spelling the more powerful your spell! Each of the doors gives you a different way of learning so the first door, ‘Spell’ reads out the word and then requires you to respell the word, the second door ‘Jumble’ asks you to rearrange the letters of the given word to spell it correctly and the final door ‘Find’ has the user try and find the word hidden in a number of different letters. The app isn’t conventional in its approach to learning spellings in a way you would see other spelling apps. There are no attempts to have the user learn by improving their phonemic awareness and when words are read out they are not done so via the sounds of the words they are simply read out. This may put some teachers or other educators off however I would suggest that when young people are learning to spell they need to access a variety of different ways to help them and this app certainly provides a way that no spelling app does. Amazingly motivates children aged 6 to 12 to spell in a magical spelling world of good verse evil. 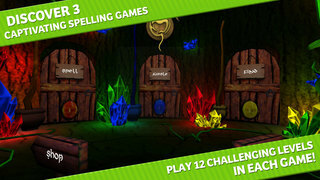 Power up the Magical Wand of Life through spelling across three enchanting games. 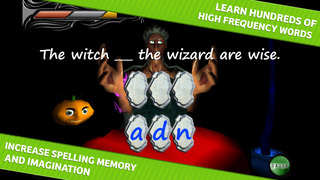 Earn magical witch money against a wand timer to increase spelling powers. 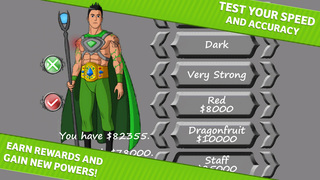 Engage in magical karate boss battles which tests the words learnt in the game. Customize their own magical avatar with mystical powers behind the SHOP door. 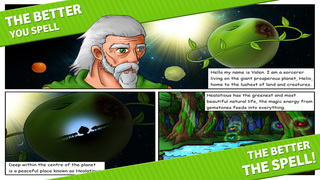 Engage in a mythical story behind the COMIC door. Greatly improves reading and comprehension skills. Fun, exciting, motivating and challenging. Spell to power up the magical wands to destroy evil. THE BETTER YOU SPELL THE BETTER THE SPELL! Designed by top educational special needs teacher with 15 years teaching experience and three educational university degrees. Greatly improves SPELLING MEMORY, SPELLING SPEED AND ACCURACY AND VOCABULARY SKILLS. Spell well to gain witch money in order to customize your own character at the shop. Unlock the powerful WAND OF LIFE in the shop by playing one difficulty level Zircon (easy), Sapphire (medium) or Golden Opal (difficult) from level 1 to 12 in all three games SPELL, JUMBLE and FIND. See evil banished from Spellwick and the game end by playing level 1 to 12 of all difficulties Zircon, Sapphire and Golden Opal of all three games SPELL, JUMBLE and FIND.